"Tender and juicy chicken that kids like better than McNuggets®! But they don't know it's better for them." Preheat an oven to 375 degrees F (190 degrees C). Grease a baking sheet with cooking spray. Beat the eggs and ranch dressing together in a bowl; set aside. Stir together the bread crumbs, garlic powder, paprika, salt, and pepper in a large bowl until evenly combined. Dip the chicken thighs into the egg mixture, then press into the breadcrumbs to coat all sides; place the chicken onto the prepared baking sheet. Cook the chicken thighs until no longer pink in the center and the juices run clear, 50 to 60 minutes. An instant-read thermometer inserted into the center should read at least 165 degrees F (74 degrees C). This was ok but I didn't like it as much as my chicken recipe. Nothing fancy but good and moist. You definitely only need about half of the bread crumbs. Very tasty and tender. My 21 month old even liked it. 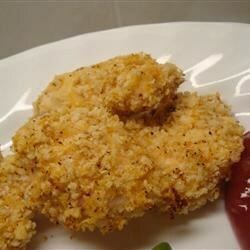 It is tender but other than that, it is plain old breaded chicken. Aside from the little extra garlic flavor, nothing stood out.